By providing vital management information, Retail Analytics enables you to personally keep an eye on the details and address any security or performance threats as soon as they occur. Who do I have to call? Retail Analytics reports on a range of topics so you quickly know if there are any issues that need your immediate attention. With Retail Analytics, you know what is going on in your stores without the need of being physically present in the store. All protocol violations, security issues and visitor information are reported so you instantly know which stores need more attention or have performed outstanding. To have access to Retail Analytics, all you have to do is make sure your Nedap hardware is connected to the Nedap servers. Which store needs my attention? 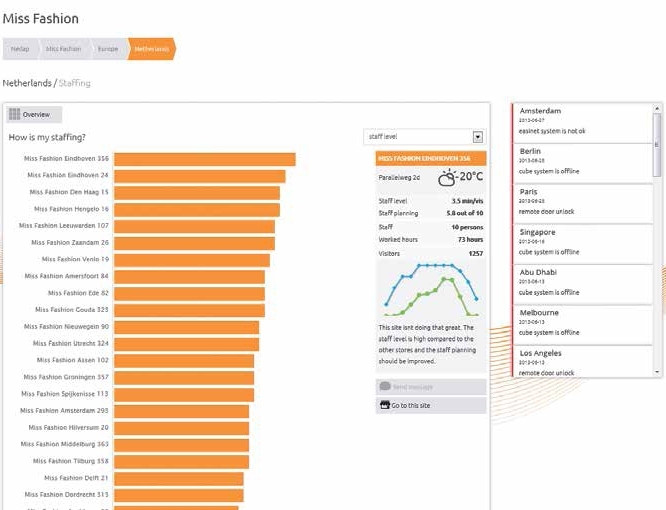 Retail Analytics is designed as a management tool at the local and (inter-)national level to compare and benchmark the performance of single or multiple stores. Assigned managers can see the information of all stores in their area. With the information provided, you can take the right actions fast as you are notified much faster about possible performance improvements or security risks. And whenever you want to take a closer look at the events in a specific store, you can immediately access each single store with a simple click. The data from the visitor counters at the store entrance is translated into the dwell time, the number of visitors and the visitors per square meter. This results in the total selling time and the consequences for the theft risk in each store. Based on this information, various decisions can be made regarding for example marketing, security, new openings and store performance. The Staffing widget enables you to make sure the right amount of staff is present in the store at the right time. Reports on the staffing level and the staff scheduling in each store give you insight whether the staff level is according to the company policy and whether the number of employees matches the number of visitors. Based on this information, your retail organization can make decisions where to spend staffing resources and where to focus on staff planning. In theory, stores with an automated energy plan should have a stable energy consumption. In practice however, the energy consumption of single stores can fluctuate significantly. 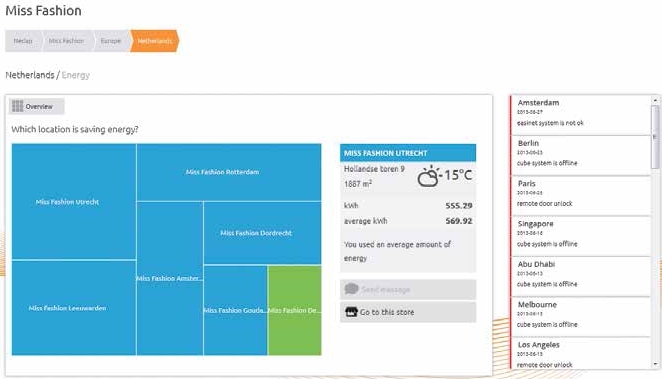 The Energy widget gives an overview of the energy consumption of each store and compares this to the past four weeks. The data provided can be a starting point to evaluate staff behaviour in relation to energy management and to optimize energy efficiency. A secure store starts with the behavior of your staff. 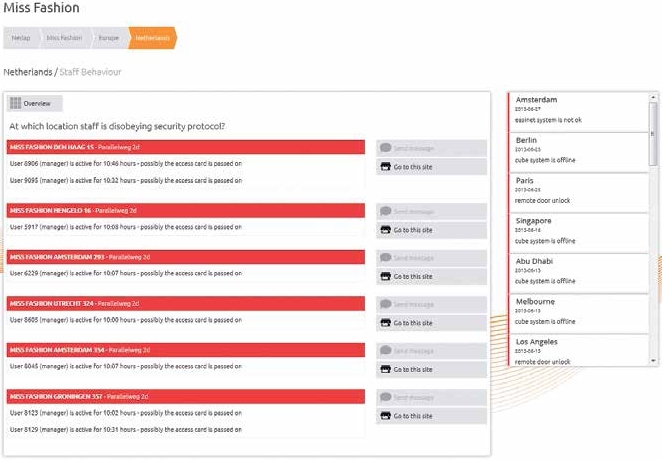 The Staff Behaviour widget reports if staff is working according to protocols and if there are any security issues influenced by the employees. 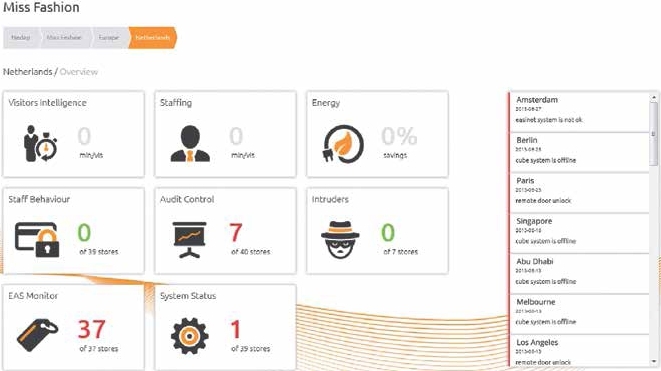 The widget signals when access cards are possibly shared by several staff members and gives a summary of events concerning the (de-)activation of an intruder alarm during closing time. The Audit Control widget monitors if the store management is working optimally to ensure a secure and profitable store. In the overview, all access cards, which have not been used for a long time are listed, and the use of identical pin codes is signaled. The E.A.S. 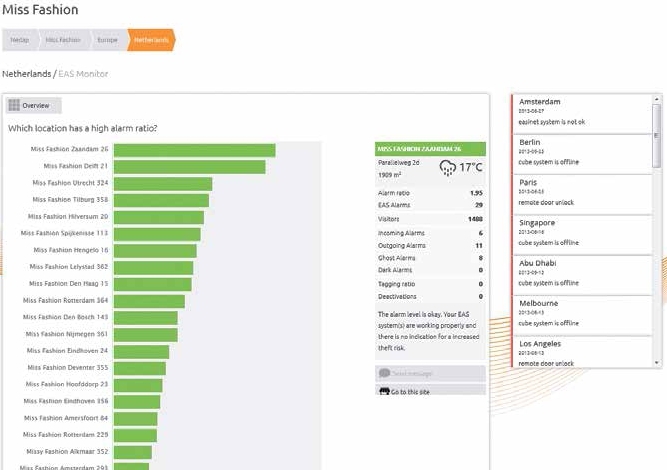 Monitor gives a detailed overview of the number and types of EAS alarms, shows the alarm ratio per store and reports about tagging levels of your merchandise. Based on this data, you can act upon the theft risk level in each store. To ensure a high profit, we want to make sure all hardware is functioning properly. 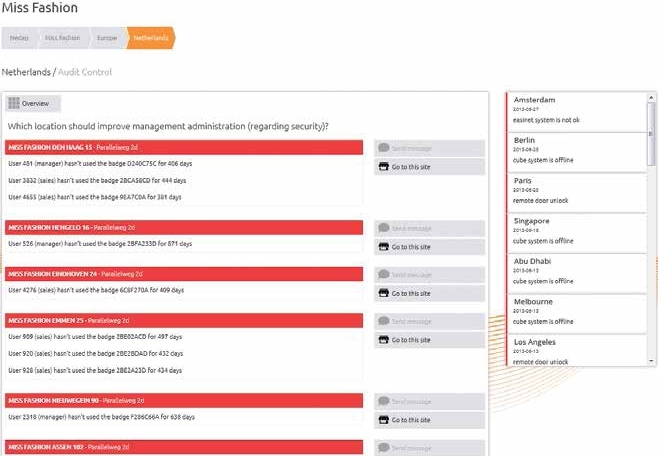 In the System Status widget, you get a quick overview of the system health and any issues related to the hardware products in the stores that deliver data to the Retail Analytics platform, such as for example the Cube Core, EAS antennas or customer counters. 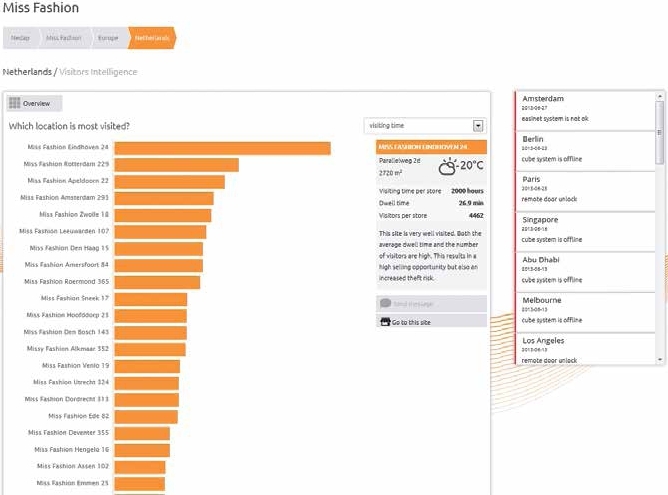 If you want to stay informed anytime and anywhere, you can also access your data with the Retail Analytics app. The app instantly informs you about visitor traffic, theft risks and staff statistics and warns you if there are any exceptional events that need your attention. The Retail Analytics app is available for Android and iOS mobile devices. Nedap Retail has an extensive network of business partners that are present in every retail market where you are present. We combine the power of being local with global support. Because all Nedap partners are certified and engineering staff continuously trained, our high quality standards are assured across the globe. Nedap Retail has offices in the Netherlands, France, Germany, the UK, Spain, China, Hong Kong, USA and the Middle East and certified partners in more than 90 countries.